The Swansea Grade is a rough 4WD road on the west side of the Iyno Mtns, taking one from the tiny community of Swansea on the shore of Owens Lake to the Burgess Mine at the Inyo crest in about 14mi. Sections are steep, narrow and feature white-knuckle sort of driving that OHV enthusiasts relish. Knowing Tom would be very interested, I had suggested this route as a way to reach a collection of 10,000-foot summits in this middle section of the range that forms a massive divide between Owens and Saline Valleys. The road was built back in the day of more feverish mining activity that saw the completion of one of the country's great engineering feats - the Saline Valley Salt Tram. It was never an economic success and mostly served to fleece some Tennessee investors of their money, but is impressive nonetheless. Brian and I had both been to New York Butte previously, but this would give Tom his first opportunity to reach this DPS summit, the 6th highest peak in the range. With a glorious sunrise on the snowy Sierra as backdrop, we spent more than two hours on the drive up Swansea Grade, including stops to examine the road and others to take in a few Wilderness appreciation moments, enjoying the views as we climbed above Owens Lake and Valley. Tom managed the drive without mishap and only a few real challenges for the Jeep's capabilities. We drove to the informal campsite at the road's end, half a mile past the Burgess Mine and just below the saddle SE of New York Butte. Tom had starting ailing the night before with a sinus infection and decided not to join us for the longer outing, but he would join us for the initial climb to New York Butte. Not knowing exactly where to find the trail, we thrashed around a bit before discovering it going around the west side of New York Butte. The trail was in good condition though it does not reach to the summit, instead bypassing it as it heads north along the crest of the range. We took about 45min to reach the top, the last 1/8mi a tame cross-country effort. The peak is fairly popular which may explain why the register wasn't very old and left in a plastic bag under a rock - the Sierra Club registers don't seem to be a hit with your standard OHV crowd. There are some swell views north and south across the backbone of the range as well as east and west to Saline Valley and the Sierra. Upon leaving the summit, we parted ways with Tom who headed back to the trail via a more direct route, while Brian and I picked it up roughly where we left it and spent the next two hours trying to follow it along the crest to reach the summit of Peak 10,460ft, about three miles to the northwest. For the most part the trail was in decent shape, but we would lose it easily on the northern slopes where it got buried under lingering snows. The snow was firm enough for easy walking, but the loss of the trail cost us some mild bushwhacking in order to find it again. We came to find that Peak 10,460ft has three summits. LoJ had the northern summit as the highpoint while PB has the surveyed Pt. 10,414ft in the middle as the highest. After eyeballing across all three summits, we concluded the north and middle summits are of similar heights and the southernmost summit to be the highest, corroborated with our GPSr (the north summit shows an extra contour on the topo map, but this almost surely is an error). This is not going to be good enough to convince anyone most likely, so it will have to wait for someone to visit with a sight level to straighten things out. In the meantime, it's probably a good idea to visit all three. Not finding a register at any of them, we left one at the northern summit (it wasn't until we were heading back that we determined the south summit was probably higher). The much higher summits of Keynot and Mt. Inyo could be seen to great effect to the north - a traverse along the Inyo Crest would certainly be an impressive feat and probably quite fun, too. We had bypassed Peak 10,327ft on our way north and now headed back south towards it. 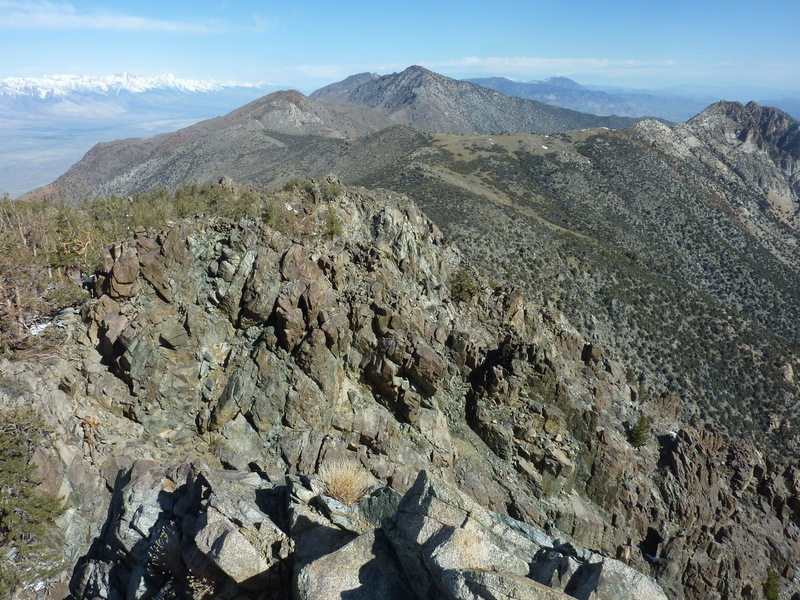 This more impressive summit lies almost a mile east of the crest, dividing Hunter and Beveridge Canyons, both dropping steeply down to Saline Valley to the east. Unlike Peak 10,460ft, it requires some solid effort to reach it, taking us a full two hours to traverse between the two, though they are separated by less than two miles. There are two summits to this peak, the east summit making for a much more formidable effort than the western summit we had landed on first. Tom had instructed Brian to make me do both summits which I would have done had there been any serious doubt as to which was higher. I could look east across to it and line it up with peaks in the Last Chance Range which I knew were lower. Brian was less convinced, and not wanting to disappoint Tom, was ready to head off to the east summit. Too tired to do it just for fun, I told Brian I'd wait for him. As he was starting down I spied what looked like a red bird house nailed to a tree just below the west summit to the east. Brian stopped by to examine it, finding a register jar tucked into it. It turned out to be a metal fire alarm box. The register had been left by Gordon & Barbara back in 1981 and was filled with all sorts of names and useful information, among which was a comment that the east summit was lower which was enough to dissuade Brian to continue with his plan to visit it. The peak has also been called "Survivor Peak" though that name hasn't seemed to percolate beyond the register. All the visitors since 2010 were the usual suspects chasing the same 10K peak list as myself. It would take us more than an hour to return back to the crest and the west side of New York Butte where we'd left Tom. I finally got a text he'd sent hours earlier, wondering where we were, but of course we were out of range. I gave him a call to see if he'd like to join us atop the last one, Peak 10,151ft. He wasn't so interested because he'd already visited it after leaving us and wasn't feeling all that well. Despite this, we were happy to find him atop the summit when we arrived about 40min later. Maybe he was just bored waiting for us. Another MacLeod/Lilley register can be found on this summit, this time from 1982. There were 23 pages to it, mostly from the usual crowd, though because of its easy access, there were also some unhappy OHV'ers that blamed the Sierra Club for trying to take their mountains away from them. So much sadness. It was 4p before we returned to the Jeep. On our way out on the road to Cerro Gordo, we stopped at the Salt Tram atop the crest and paid a visit to its workings and the nearby caretaker's building. Some work has been done on restoring the historic building though there is still much to be done. At least it didn't have the feel of a hantavirus breeding ground. It would be after 6p by the time we returned back down to Swansea at SR190, following the very well-graded Cerro Gordo Road that appears to be in fine condition for any vehicle. I found a note on my windshield from Adam Jantz who must have been passing by and recognized the van. He used a full sheet of notepaper to write, "Hi Bob, Adam J". Adam was never one to waste words.